"Richmond Park is a site of both national and international importance for wildlife conservation. It is London's largest Site of Special Scientific Interest, a National Nature Reserve and a Special Area of Conservation." It's an old royal "hunting" park, which contains hundreds of "ancient" and "veteran" trees, notably oaks, some 700 years old. It's a beautiful haven so close to London, supposedly teeming with wildlife, though I haven't had a lot of luck. I am now technically retired-ish, so I hope to have more time to discover it, as it's only a couple of miles from home. It's increasingly popular with visitors, so the habitats are under proportionate pressure. One of the new problems is the Oak Processionary Moth , so called because of the movement habit of the caterpillars, which are active from May to July. 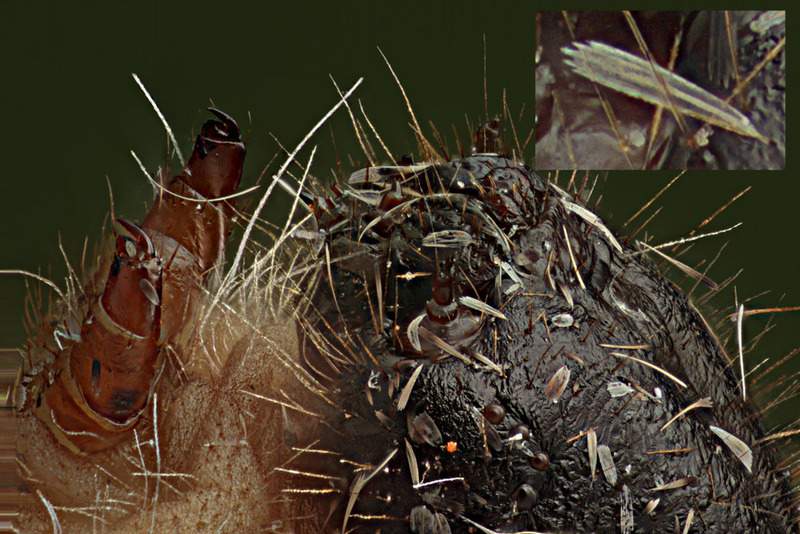 Apart from the damage to the trees, the problem they cause is from the urticating hairs which the later instars carry wikimedia pic , and shed. They are nasty things to get into your skin, causing rashes and reactions which vary in severity, up to extreme. In continental Europe they're a bigger problem and are poisoned, as they are outside the park. However, in view of the status of the place, this approach has been resisted within. If the incidence continues to rise at current rates (nest numbers have multiplied by a factor of several over each of the last 4 years, approaching 2000 last year) then parts of the park will have to be roped off and "out of bounds" to the public. 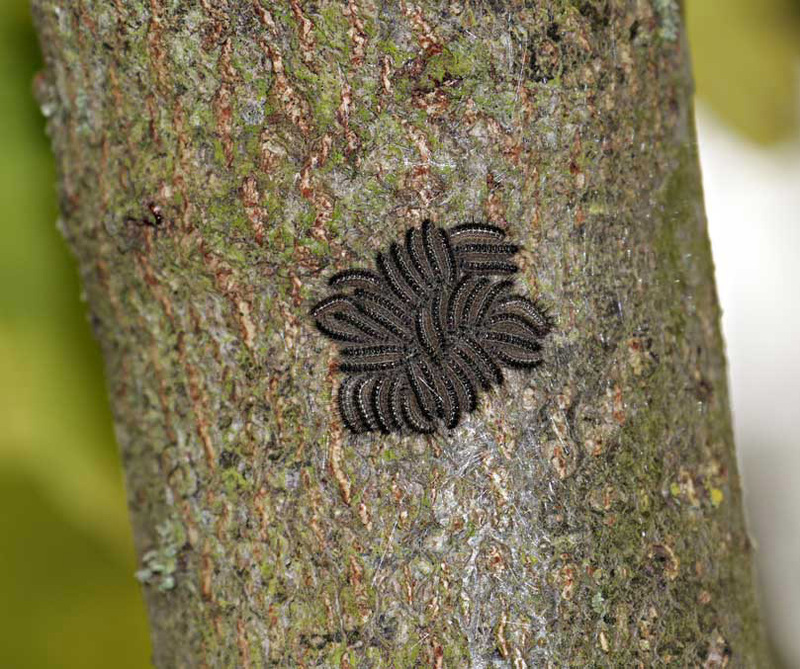 The strategy has been to locate and mark the trees as early as possible (the earlier instars do not have the hairs) then a hit squad goes in to physically remove and burn the caterpillars, and burn out any remnants. Up to last year, this worked, in that there were very few reports of problems of contact, but it's feared that sooner or later, it won't. This year, my wife and I shall be joining the army of volunteers with maps and binoculars and coloured pins. I shall also be carrying a camera and some little boxes. I'm about to be "trained" along with a lot of other volunteers in the art of finding the OPM (nests) on the trees, as they're just coming up to the time when they show. We don't want to spray a lot of chemicals about so mechanical removal is the current strategy. That may have to change as the numbers are rising dramatically each year. I'll be discovering how photogenic, or otherwise, they are. Right NOW is a good time to visit the park's Isabella Plantation , which was set out in 1831 but has been developed since. It's very popular showing its hundreds of Rhododendrons and Azaleas, at this time of year, though it's a small area (17 Hectares) within the park's 1000Ha (3.9 square miles). The park is effectively contains part of the road system of this part of London though the speed limit is now 20mph (~30kph). With numbers like half a million visitors a year, there's considerable pressure on its natural resources; a balance between accessibility and conservation. The OPM caterpillars are out. Subjected to the full fury of an English Summer, they were reticent at first. The first couple of instars aren't dangerous because their urticating hairs aren't developed, but from #3 onwards they are a health hazard. They "process" around the tree on their way from lunch (the leaves) to a variable "nest" where they congregate, and from about instar #3 on, then cover themselves with sticky silk. It's called "processing" because they follow each other nose to tail. The popular press is amused, because they can be made to go in a circle. 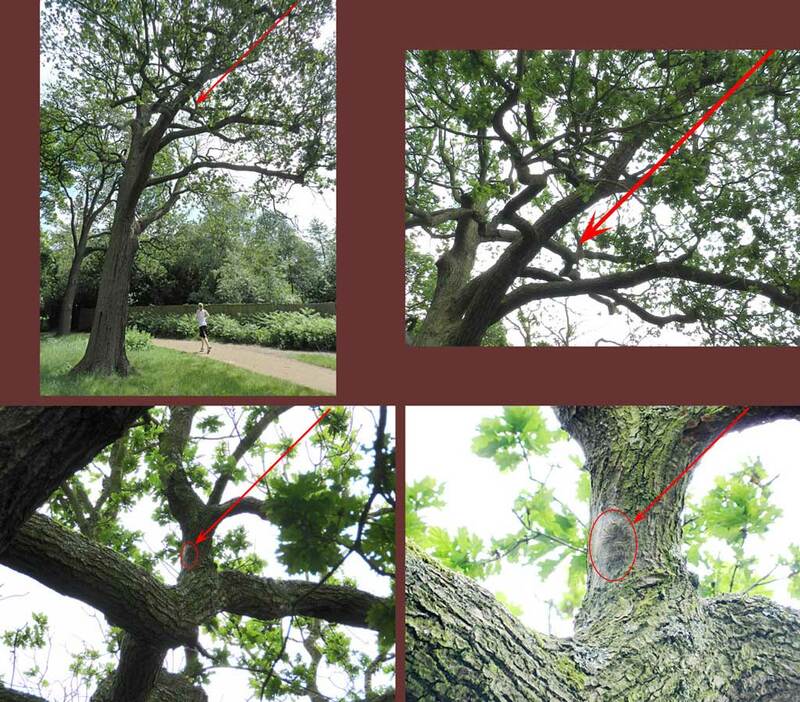 As Richmond Park is a National Nature Reserve and SSSI, spraying is not a first resort. There are two possibles, a lepidoptera specific chemical which is known to cause a lot of problems in other species as well, or a bacillus which is difficult to apply and very short-lived. So the tactic, for now, is to find them on the tree and mechanically remove them. Large numbers of volunteers do the spotting, report with GPS, and the hit squads is summoned, depending on the site sensitivity (access to public). I ( + wife) was allocated a low-density zone, away from the heavily infested side of the park ( it's 2 miles/3km) across. Second tree I saw, in the car park, one meter off the ground, and there they were. No camera - who expects to find anything the first try?? They (all but a few)were vacuumed off within an hour. Numbers are up on previous years, where the figures were something like 5, 25, 250, 1800 nests found. So we're on track for several thousand, and nobody knows quite what the park will be doing about it in future. Images here are full frame from a Nikon P500, showing off its 36x zoom. (24 - 864mm equivalent). Its corner quality, auto sharpening, etc etc, are hideous, but it does go in a big pocket. Nest found with Canon 10x stabilised binos. If you're looking for binoculars, do try stabilised ones. Just wanted to thank you for this posting and the follow-ups, reading with interest! Over here we too have problems with Thaumetopoea processionea, the species has been expanding its range and was recorded for the first time from the very north of the country in 2011. This is very interesting, Chris--please continue to keep us in the loop! A couple of years ago, a plague of forest tent caterpillars descended upon the Pennsylvania mountains where I spend some of my time. For miles around, there was scarcely a leaf remaining on any tree. The summer forest looked like winter forest. The state responded quickly, releasing quantities of a fly that is parasitic upon the pest. The next year, the flies outnumbered the forest tent caterpillars, and the year after that, these caterpillars were gone. This year, the forest looks as if nothing touched it. I hope your park fares at least as well. I'm curious - how does a 3rd instar larva get to have moth scales all over its face? I saw none I saw on the body. A poor pic, but shows some scales: Fov 3mm.